A lot of TV shows are terrible, but let’s face it: we’re lucky. Behind every abomination unleashed on those watching at home, there are likely a dozen potential shows too horrid to be aired, and perhaps a much smaller number of promising series that met the same fate. Often these pitches, good or bad, get only a pilot episode left behind as proof that someone was going to make a show about imprisoned penguins, Aquaman, or a samurai who drove an eighteen-wheeler and pressed elevator buttons with his sword. Well, here’s some more proof: the six most intriguing TV pilots we found, plus five that are also intriguing, but for all the wrong reasons. These are series that we would have watched on TV, whether to see something genuinely good or catch something that would clearly be canceled once the networks saw the ratings. It’s too early to judge the Sci-Fi Channel’s Tin Man as a failed pilot, but attempts at reviving The Wizard of Oz often go unappreciated. Witness the 1985 sequel Return to Oz, dismissed by many critics in spite of its long-standing contributions to inducing psychological trauma in children. Lost in Oz took up the same mantle in 2002, fashioning a Wizard sequel that lands a good distance from its source material. In the pilot scripted by David “Solid Snake” Hayter, an uncertain young Kansas bride-to-be named Alexandra Wilder (search that name for a Dorothy pun, but I don’t see one) is whisked off to the lush fantasyland of Oz during a tornado. With the aid of a displaced horse and an alt-rock soundtrack, she explores her new surroundings, meeting an equally stranded World War II soldier who functions as a smarter and completely human romantic-interest version of the Scarecrow. They’re recruited by one of Oz’s good witches and sent to rescue the kingdom’s rightful queen. Lost in Oz suffers from rushed exposition and too-cute dialogue that often recalls some abortive Joss Whedon project, but there’s a compelling idea or two at its heart. Despite the limp self-mockery, the pilot episode introduces some grisly takes on Oz lore (the Munchkins met an unspeakable fate) and an appearance by the scariest thing from Return to Oz: those shrieking, fucked-up Wheelers. The best bastardization is a flirty, revenge-driven version of the Patchwork Girl. Apparently stitched together from high-school goths’ spare leather, she’s a lot more fun than the show’s wincing Dorothy stand-in. The Lost in Oz pilot wasn’t officially completed or aired anywhere, but that hasn’t stopped the Internet from preserving all of its rough, diced-up potential. For extra fun, try and spot the moments where some CG was clearly supposed to make things more impressive. Why It Failed: If the hurried pace didn’t turn off test audiences, that ending song certainly would. Star Trek episodes could be many things: social commentaries, morality plays, excuses to use cheap Nazi uniforms and have women slink around in green body paint, and so on. At least one episode, Assignment Earth, was a slyly inserted pilot for another Gene Roddenberry science fiction series. In this particular episode, the Enterprise once again travels back in time to the 1960s, whereupon an intergalactic secret agent named Gary Seven (Robert Lansing) beams himself and his cat aboard the Enterprise, revealing that he’s a time traveler out to help Earth make it through a turbulent age. Despite Kirk and Spock’s meddling, Seven manages to defuse the nuclear arms race and gain an unexpected ally in the skeptical Roberta Lincoln (Terri Garr). Things end with hints of further adventures for Seven and Lincoln, who’s noticed that Seven’s cat is apparently a voluptuous woman (Victoria Vetri) in disguise. What, you thought anime invented that? Assignment: Earth never became a series, and Garr went on to Young Frankenstein and Close Encounters of the Third Kind, and Lansing went on to a recurring role on The Equalizer. Star Trek fans, hopeful as ever, like to imagine an alternate universe where Spock has a beard and Assignment: Earth was a full-fledged TV show, and they’ve created their own openings for it. Here’s the least awful one. Why It Failed: Roddenbery had trouble keeping Star Trek on the air by the time Assignment: Earth closed the second season. Another sci-fi show was a bit much to ask. If conspiracy theories and Matrix-style secret agents are now pass?, they weren’t quite so stale in 2002, when comics icon Warren Ellis started the twelve-issue comic Global Frequency. Illustrated by multiple artists, the series tracked an extensively well-financed shadow organization that defused various threats to world peace. It’s not Ellis’ most original concept, but the comic proved interesting, mostly because it played out like a TV series that had free reign to kill off characters. The only exceptions were Global Frequency sub-leader Miranda Zero and her hacker sidekick. It was fertile ground for a TV series, and writer John Rogers (who probably deserves better than to be linked to the recent Catwoman and Transformers movies, but we’ll link him anyway) put together a pilot in 2005, with Miranda Zero played by Michelle Forbes of Star Trek: The Next Generation and 24 fame. While it carried off the comic’s drama with a brisk, stylish pace, the pilot apparently introduced two regular Global Frequency agents, thus stripping a series of some anyone-can-die intrigue. This ultimately didn’t matter, because that series never materialized. Why It Failed: In an entirely apt twist, the pilot leaked out through every possible Internet route, and, according to Ellis, the producers were upset enough to ensure that we never see a Global Frequency show. The anime industry’s war on Western cartoons had only begun in 2000, and few American shows were bothering to imitate their big-eyed, blue-haired Japanese counterparts back then. One of the first to try was one of the better results of this cultural invasion. Developed by writer Micah Wright, Constant Payne followed a self-confidently scatterbrained teenager named Amanda Payne, who helped her crime-fighting scientist father fend off terrorists, henchmen, and evil relatives. Only a 10-minute pilot was produced, showing off rapid-fire snark and lots of fistfights and explosions animated by the anime studio Madhouse. It’s certainly a cut above the children’s fare of its day, with creative action and dialogue that flows like an episode of Home Movies. Even though it was thrown in a ditch, Constant Payne was clearly ahead of its time. In the years that followed its pilot episode, lamer anime-style American cartoons such as Totally Spies and Jackie Chan Adventures took root on Cartoon Network, and Nickelodeon eventually got into the act with the violent, explosion-filled Avatar: The Last Airbender. If some executives hadn’t lost their nerve for no real reason, Constant Payne would’ve been one the best things on Nick since David the Gnome died. Why It Failed: According to Wright’s website, Nickelodeon initially dragged its feet on introducing even PG-level violence in one of its shows. Then 9-11 happened, and the network nixed any series that showed anything blowing up in a city. 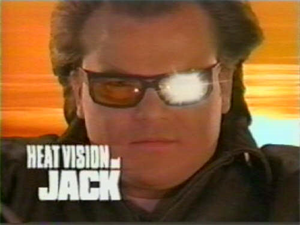 Vanity projects rarely go well, but Ben Stiller and writer Rob Schrab (Scud: The Disposable Assassin) probably knew this when TV executives let them make Heat Vision and Jack in 1999. So Stiller plays up the self-indulgence, with a deliberately hammy introduction to a deliberately hammy show. In his creation, Jack Black is an astronaut granted immeasurable intelligence by a brush with extreme sunlight (yes, it’s a parody of another failed TV pilot called Northstar), while Owen Wilson voices his roommate, who was psychically trapped in a motorcycle by a government agent’s death ray. With Jack’s sun-fueled mental prowess in high demand, they’re pursued by the sinister Ron Silver. No, not a character played by Ron Silver. Just Ron Silver. 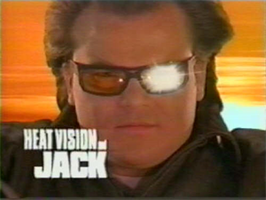 It sounds like a live-action Turbo Teen, and there’s no question that Heat Vision and Jack knows just how hokey it is during its pilot episode, in which the genius-by-day renegade astronaut and his talking motorcycle battle alien inhabiting the body of Vincent Schiavelli, the expert in portraying sad-sack weirdoes. Jack neutralizes the creature with a scheme worthy of Doctor Who (which Heat Vision watches on TV) and romances a local sheriff played by Christine Taylor, the Hey Dude alumna and Stiller’s future wife. Then he rides off into the intellect-dulling night. No woman can hold him. If Constant Payne got in on the anime-esque cartoon craze too soon, Heat Vision and Jack was nearly a decade too early to join Adult Swim’s vein of self-aware live-action parodies. With a higher budget and Ron Silver playing himself, it’s arguably better than Saul of the Mole Men or Fat Guy Stuck in Internet. Why it Failed: The world just wasn’t ready for Heat Vision and Jack, though Schrab recently confirmed that a movie version’s in the works. Let’s see the TV execs stop it now. Yet The Crystal Cube had ambitions beyond mocking Blake’s 7 (and borrowing its Federation guard helmets). As our heroes walk off toward a brave new world, the show then dissolves to a science-oriented talk show where Laurie and Thompson join Stephen Fry and Robbie Coltrane in discussing the nature of genetics and great moments in scientific history. From there the pilot episode, written in 1983 by Fry and Laurie, rapidly turns into a hilarious, far-roaming parody, from Coltrane’s turn as a paranoid Cold-War undercover journalism to Thompson’s take on a vapid, talking-head anchor. If only the laugh track weren’t there. Why it Failed: We can’t say. Perhaps it was a bit too complex of a comedy for a TV audience that let The Benny Hill Show run for twenty years. Head to page 2 to discover the 5 worst TV pilot failures! Most of them involve dogs, strangely. There’s really no limit to the amount of justly discarded TV pilots out there, but we dug deep, past that awful sitcom starring Andy Kaufman as a robot in the 1960s future, and past that TV movie where Leonard Nimoy played a racecar driver with psychic powers. We wanted the pilots that symbolized inept TV-executive hubris at its worst, and we found them. One can enjoy Doctor Who at any age, but the old series is best taken in when you’re nine years old and perfectly willing to accept that a giant alien made from anhammy actor and a bunch of Styrofoam rocks could be defeated by the jovial, frizzy-haired Doctor tripping it with his scarf. So was perfectly acceptable that the people behind the series decided to take its most kid-friendly character, the robot dog K-9, and stick him in a show of his own back in 1981. Yet K-9 and Company was also producer John Nathan-Turner’s attempt to bring back Sarah Jane Smith (Elizabeth Sladen), the Fourth and Most Memorable Doctor’s former sidekick. So the pilot opens not with K-9, but with scenes of masked cultists carrying out pentagram-festooned witchery (in a kids’ show, remember) at some ruins in the English countryside. We then meet Sarah Jane, who comes to visit her never-before-seen Aunt Lavinia, yet finds only her aunt’s young ward, Brendan. After almost 15 minutes of dreary British conversation, the two of them find K-9 left as a present from the Doctor, who apparently realized that the dog was stealing his spotlight. As the rest of the episode blandly plays out, K-9 helps his new masters repel a coven of witches upset over an anti-Wiccan letter that Sarah’s aunt wrote to the local paper. Yes, the action positively explodes from the editorial page as K-9 putters around and battles overly superstitious gardeners. K-9 and Company would survive its pilot, however. In 2007, a re-launched Doctor Who and a guest appearance by Sladen inspired The Sarah Jane Adventures, albeit with mere K-9 cameos. That’s because the robot dog is getting his own series courtesy of Jetix. It looks like a sub-Dreamworks disgrace, but the bar for K-9 spin-offs was set admittedly low over 27 years ago. Why it Failed: Doctor Who was driven by interesting concepts. K-9 and Company runs out of those twenty seconds into its opening song. It’s all because of Turner and Hooch, really. That 1989 film about Tom Hanks and a lovably ugly police dog inspired a decade of imitators, from the short-lived (except in Italy!) Tequila and Bonetti to the Chuck Norris showcase of Top Dog. Before most of the rip-offs came along, someone at NBC had an idea: what if, instead of a cop partnering with a dog, a cop became a dog? And because no one had a better idea for that particular portion of the NBC budget, a Poochinski pilot episode was made and aired. Peter Boyle, whose Emmy-winning guest spot on The X-Files was still ahead of him, played Detective Poochinski, whose unlikely surname foreshadowed his death in the line of duty and his subsequent reincarnation as a talking bulldog puppet. Dealing with both the comical and heart-wrenching details of his new life, Poochinski paired up with a rookie detective played by George Newburn, who we’re contractually bound to identify as the voice of Sephiroth in Final Fantasy VII: Advent Children. And that’s about as far as Poochinski got before the pilot ran out. Why It Failed: If you have to ask, you haven’t seen the clip, which comes from a helpful TV special about the worst shows never made. Every child of the ’80s knew a moment when E.T. stopped being adorable and became just sort of annoying. So it followed that nearly every low-budget E.T. rip-off, with the possible exception of Alf, was instantly creepy and loathsome. For examples, we have the Muppety horrors from M.A.C. and Me, the evil conehead-anteaters from Pod People, the squalling snot-creature from Nukie, the capering ewok jackass from Fuzzbucket, and the miscalculated experiment so terrible he was never fully unleashed on the public: Wishman. Granted, the Wishman creature wasn’t an alien or some Ritalin-needing kid’s un-imaginary friend, but he’s every bit a turdlike by-product of E.T. culture, with his huge eyes, childlike curiosity, mysterious abilities, and government-backed enemies. Resembling a fat cartoon sea monkey, Wishman is some experimental “biological robot” rescued from a swift demise by a bleeding-heart scientist and his apparently desperate-for-a-child wife, played by Linda Hamilton. The couple takes Wishman on the road to escape a bounty hunter sent by his corporate creators, who’ve apparently realized the horrible PR that could result from their having brought an ugly, hairless troll doll into the world. Wishman‘s 1983 pilot failed to catch the imagination of viewers, though it served to train Hamilton for a career of playing opposite killer robots and monstrous, sewer-dwelling dog-men. Few things could scare you once you’d shared the screen with a gurgling, staring, electric mutant toddler. Why It Failed: Any given scene involving Wishman. Decades before K-9 and Company and Poochinski were making the world hate dog-related TV pilots, the producers of the 1950s hit The Adventures of Superman tried something desperate to keep the program in the public eye. The show needed a spin-off that didn’t depend so much on star George Reeves, who was trying to avoid playing Superman well into his forties. The solution? The Adventures of SuperPup. An all-animal version of Superman was pretty pedestrian by the insane “what-if” standards of the comic book world, but in a live TV series, it became a Lynchean freak show that raised all sorts of questions. Why did midge…er, little people play all the roles? Why was Bark Bent working at the Daily Bugle? What Superman regular is the mouse supposed to be? Why Superpup? Unless he’s a child superhero, shouldn’t it be Superdog? Superpup was never on the air, as far as we can tell. Even if it had seen the light of day, it would’ve been overshadowed in the next decade by Underdog, which at least knew that superhero parodies are better of as cartoons than poorly-synced Chuck E. Cheese nightmares. Why It Failed: Bark Bent. In 1989, a giant mechanical dinosaur called Robosaurus launched a career of regaling crowds at monster-truck rallies by breathing fire and devouring cars in his mighty metal jaws. A few years down the road, someone decided that Robosaurus deserved more than just the taste of a rusted-out 1983 Plymouth Reliant and the adoring, drunken cheers of an audience too uncouth for NASCAR. Robosaurus deserved his own TV series, dammit. Instead of going the ’80s route and commissioning a terrible cartoon (which would only have attracted the Robotix lawyers, anyway), producers made Robosaurus the star of a movie-length pilot for a cop show called Steel Justice. In the environmentally ravaged future, detective David Nash’s son dies in a tragic car accident and gets reincarnated as a pint-size Robosaurus, soon to be sold at Kay-Bee Toys locations near you. After talking things over with some ancient mystic being (and a friend played by an out-of-place Joan Chen), Nash learns that his toy-bound son can grow to enormous size. When the criminals of the future hold the innocents of the future at bay and the bullets of the future are flying, Kid Robosaurus transforms into his towering truck-rally form and belches out some justice. Steel justice. Why It Failed: We really have no idea. We would watch this show. We would plan an evening around this show. We would tape every last episode of this show to prepare for a world where it might never be released on DVD. And so would you. Previous ArticleNeil Can’t Stop Here…This Is Bat Country!